Okay this one's crazy - not just for the fact for what I now have on the trading block, but for the way it happened. I just got a phone call about this. I said yes on the spot. The person who lives in the other half of Jody Gnant's duplex in Phoenix is named Leslie. Leslie pays rent on her half of the duplex. Leslie had an idea on how to not pay rent for one year in her duplex. Leslie works at Alice Cooper's restaurant in Phoenix, Alice Cooper'stown. Leslie didn’t have anything to trade but had a valuable resource - her boss! She asked Alice Cooper if he would help her get free rent for one year. She told him her idea. Alice Cooper listened. 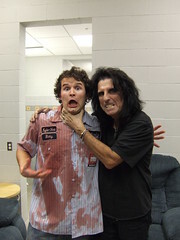 Alice Cooper was honored to help out one of his staff in such an awesome way, and jumped at the chance. And that's how it played out. Alice Cooper agreed to spend an afternoon with a fan so that Leslie can get one year of free rent. Yes, as far as Leslie and I are concerned, Alice Cooper is pretty much the coolest living legend/restaurant owner of all time. -one afternoon with Alice Cooper. One of a variety of activities is possible: golfing, songwriting, jamming, hanging out, dining, Alice's courtesy laughs at your clever "We're not worthy's" ... the sky's the limit. Maybe he'll even invite you to hang out with him on his radio show in Phoenix or chill backstage at a show....it really depends on whether you meet up with Alice in Phoenix or meet him on one of his days off while he's on the road for his upcoming tour! So that's how it is: Leslie now has one year of free rent in her duplex (well, actually, she has to move to the other half of the duplex - I really think we should hold her to it. ), and I now have one afternoon with Alice Cooper. Now I'm a huge Alice Cooper fan, and would love nothing more than spend an afternoon boring him silly with my favorite Milwaukee-related lines from Wayne's World, but I pledged to keep making trades until I get up to a house. And "one afternoon with Alice Cooper" isn't a house, so I've gotta make a trade! Big thanks to the combined force of a packed Fargo house and Alice Cooper for making one red paperclip rock harder than I'm sure any of us ever imagined. Tonight was insane. A balloon was filled with blood. It exploded all over the crowd. I "never saw it coming." I then got hosed off stage by a giant stream of blood. The giant red paperclip got ripped to shreds by the crowd. 20/20 from ABC caught the whole thing on tape. I then autographed pieces of giant red paperclip. None of this has ever happened before. To me at least. Safe to say I won't ever wash that shirt. I was only reading this last night! Log on this morning and all's changed! I think it's a great trade! hey man you are real cool!! haha who ever thought ..one red clip...woots... go all the way man!! we will be rooting for ya!!! Ha! Awesome. You know this could be the one. There just might be one rich as hell die hard Alice Cooper fan out there who would give you a house for this. My newspaper did a small article on you the other day and that's how i got here. Just out of curiosity: what will you do after you made your final trade? OMG, how did that fall into your lap? Id go golfing with him for the day, hes a huge golf fan, plus we could blast soem of his tunes from the golf cart!! And he is coming to Ottawa! Oh man, if I had something to trade, I would SO be there! Oh well, keep up the swapping. I think this was an even trade. Alice Cooper is cool, but a year of free rent is worth a lot. I think your house is still a few trades off. Per charlotte's post, After your final trade, you need to buy a box of red paperclips and see if you can trade for a house immediately. Who needs an MBA? Dreamers start companies and then they hire MBAs to run them. First of all. Great site, Great idea, and great adventures you are on here. Really great fun and amazing to follow your blog. "What the heck do you think you are doing?? Dont push your luck too far now, Boy!!" lol. I guess it is hot in phoenix, like 115 degrees in the summer. So guess one day is better than an year?? So guess you trade might be ok. Anyway Alice Cooper got to be satisfaction guranteed. He play golf and he is good at it. He is a lving legend in music and on stage, He is an extraordinairy vocalist, one of the best singer ever. He was an alcoholic, he owns a restaurant, he travels the world.Etc Etc. What am I trying to say here??? Oh Yeah! Alice Cooper got personality. He rocks aint that what it is all about??? Here's an Alice Cooper quote for you: "Disco drove me to drink"
Thanks for all the fun Kyle. Looking forward to follow the next step. Keep up the good work. Way To Go Kyle. God Bless You. Dude, that's crazy. I checked into your blog just a few minutes ago to see your latest trade. And who did I run into at a Phoenix Safeway a couple hours back as I was leaving and he was coming in, intently pushing his shopping cart? This is great. More people should do this. A while back a radioshow in Sweden did something like it. Keep up the good work and good luck getting the house. Alice Cooper= one of a kind. It's a shame I don't have anything to put of for this. I would LOVE to spend a day with that guy. HEY I HAVE A GERNERAL LEE FOR YA! Well, this one sure made me have conniptions this morning! I first heard about OneRedPaperClip on the morning news a few days ago. I guess it was about the time of the Yahk trade. I live in BC, so of course Global was all over it. Anyway, I thought it was a great idea! Then I saw the current trade. Oh. My. God. I'll give you an idea of the impact - I was on the SickthingsUK website at the time. Yep, I'm a totally obsessed Alice fan and have been for about thirty-two years. I'm out of luck, though, unless you'd consider trading for a lazy, video game addicted, seventeen year old boy? NO? Oh well, didn't think so. Guess I better keep him anyway. The cat would miss him. ;) Heh heh heh. You have been busy, best of luck in the quest for the holy grail! All the best from good ol' Blighty! This is all very amazing. A few friends of mine had this idea but trying to end up with the deed to a silver mine. Bravo for actually doing this. Wow! Way to go Alice and Kyle (and Leslie)! Cooperative efforts by humans that make this little dog proud! I am so amused by all the people I mention ORP blog to that have just heard about you on the news or something. I have nothing to offer but my awe. You are the coolest guy EVER. Hold out for that house man, I've kept with all this since the beginning and I hope the next one is the end! ooohhh that summer in Hollywood was what I thought you would choose. It came with a posrshe! I hope you get your house! Dude, brilliant idea with the red paper clip swap. I love that you are making the "impossible" possible. You inspire me. I know that you will get your house one day! Pulling for ya buddy...good luck! hi i m from singapore i am 12 years old. i read about u in the kids' newspaper.. u r so lucky to so many things using just a red paper clip.. i think i m going to use a blue paper clip to start trading.. This is awesome, keep up the good work! If a Belgian d'Watermael (a type of Belgian chicken) somehow ends up in a trade, I'd jump in too. But I don't know who would offer one in exchange for an afternoon with Alice, lol. Some how I can't see a person wanting a chicken that bad unless they were me. Hi im from Holland I read aboutyou in a newspaper so I went to your site immedietly. It's SO COOL what you're doing!! je savais bien que les montrealais avaient les meilleurs idees!!! God bless you in your endeavor! Congratulations for your effort, I'm really impresed with what you have done. Continue with your good work and I'm sure you will have your own house. CONGRATS!! I've been following this for a while now, and this is amazing. I can't believe you've got an afternoon with Alice Cooper to give away, that's awesome. I think 5 more trades to the house. It's got to be getting closer. All the way from Edmonton, Alberta, Canada. Hey Kyle. Great idea. I love your writing and your wit. I'm a pastor, and I used your story as a sermon illustration today. So your red paper clip has now made it to church in Bedford, TX. Hi Kyle. Just caught the tail end of an interview with you on the radio, up here in Thunder Bay, Ontario and had to check out your website right away to find out what exactly it was all about. What a cool idea, I wish I'd heard about you when the trading was for smaller items. Anxiously waiting to see what you get for Alice and when (not if) you get your house. Raaaaah ça me fait vraiment trop rire, c'est énorme! I'm just wondering... who will really give is house for spending an afternoon with Alice Cooper?? I think that this trade is the most dangerous trade you did... hope you'll get something bigger! OMG thats amaizing i want to try that .... how do u do it?? hey kyle, when you get your house, you should throw the biggest house warming party ever! then you'll really make out like a bandit! best wishes!!! 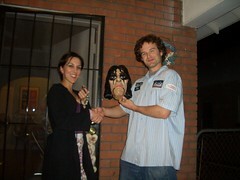 Hey Kyle congratulations from costa rica .. my name is vicky a big Alice Cooper Fan .. since ten years .. I dream with know the master personally .. and I give you all that you want .. sorry but my english is very bad .. but I give you all really .. I love Alice forever ..
Wow great job with the "One Red Paperclip" idea. I just recently found this site through www.collegehumor.com, and when I saw you mentioned Cooper'stown, I couldn't help but make a post. I have been to that restaurant several times and I remember Leslie because she was my waitress for one of my visits. She sure does look a lot different without her required makeup (anyone who has been there will know what I mean). I hope you get your house soon Kyle. Amazing job Kyle I'll never look at a red paperclip the same way again. Matter of fact when ever I come across a red paper clip I'll save it and when you get your house I'll send them your way. Hey ! I've got this ready ready cool thing to offer . I am willing to trade my ready Big Lips for an afternoon with that cooper guy. I have the roll of glow in the dark toilet . Good huh ? I know U will like it. I get it now. Alice Cooper! Welcome to my nightmare! The whole red paper clip thing was just one big nightmare! Or is it? Just kidding Kyle. Keep up the good work. An Absolutely Amazing Idea! 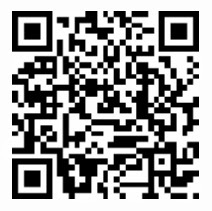 I found your site from a link on DAILYTOOL.COM. I hope you'll go all the way. If the Alice thing doesn't work out the way you expect, you could get another star to trade him/herself for a day with Alice AND a day with someone from your site. I bet many of them would do it just for the publicity! Can't wait to see what finally happens. What an insanely cool experiment! I can trade 1 pallet of Spagetti Squash (50 cases) in Pompano Beach, FL. for an afternoon w/Alice. 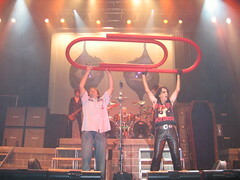 i was at alice's show in fargo, nd monday night and i was stoked to see the encore with the big red paperclip. what a great show and good luck with the house! so what do you get from a box of paperclips? a box of houses, maybe? Hi man, I am a Chinese girl and heared of you through the medium. It is wonderful idea and wish you to achieve your goal. err just what are you going to do once you get a house??? try and find a job??? or will you trade in for a monopoly of houses lol! meet kyle the next donald trump! I"m a huge alice cooper fan, i wish i had a house i could trade you with! Maybe Dan will be willing to swap his house for an afternoon with Alice Cooper. I dont know if all you guys are old, but isnt alice cooper from one of the hair bands in the 80's? Rent for a year in exchange for a day with a has been? I dont know, I think you took a step back!! The house for a year is worth at least $12,000!! !a day with him, thats a thousand (if you guys say he is as cool as some of you think) I dont know..... BUT YOU GOT ME WATCHING LIKE A CRACK HEAD!!! KEEP IT UP! The news is all over the world and has even reached little Denmark, Scandinavia in Europe. I know you will get a good deal for Alice Cooper, as someone might feel they are ripping YOU off for this trade. The best of luck with all your trades. Maybe someone will offer you a pen, or a camping stove for the snow globe...oh wait, been there done that. Maybe we better call in the KISS army to get hte situation under control. I watched TV "UNBELIEVABLE" that Japanese TV program tonight. Their plan is very crazy and fun. 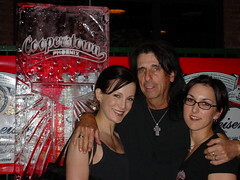 So good to see you`re helping the girls with their Alice Cooper Hall Of Fame campaign! Alice Cooper is so awesome and sweet! HAHA you must be a hero at your local pub!! im in Australia and you were on prime time tv, haha a cool show called beyond tomorrow, your a hero, good on you mate! what a fantastic idea. I saw it on the telly the other night and had to check out your website. Good luck with your innovative idea. Hope you get your dream home. Kyle, This is the most unbelieveable thing I have ever heard of! You are a genius! And you are a cutie too. Keep up the good work! You are crazy, Kyle! Love it! we discussed in english class your website! 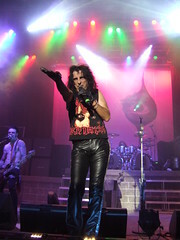 Alice Cooper Rocks!. Just saw his show and he's better than he was 10 years ago. I found a list of all his tour dates and information about scoring tickets to all his shows. We can even get tickets to sold out shows. I'm reading your book One Red Paperclip and I'm am up to the part where you have an afternoon with Alice Cooper. First of all I thought that the book was fiction, but then I wandered it is written in first person and the main character is Kyle Macdonald and so is the author then I went on to Youtube.com and found out that you are a real guy. Cool. I asked some of my friends if they thought I could trade something for bigger and better things they said that it was impossible to trade a piece of stationary for a house, so I showed them the book and they said that you were fiction (by the way that was also another reason I searched you on Youtube. Do you have any advice??? Please write back.